It’s just a one-block closure, but please take note if you’re planning on traveling around the Little Tokyo and Civic Center area on Saturday or live/work in the area. The Regional Connector is a 1.9-mile underground light rail line that will connect the Gold Line to the Blue and Expo Lines, allowing a one-seat ride for most riders through downtown Los Angeles. The project is partially funded by Measure R, the half-cent sales tax increase approved by L.A. County voters in 2008. The project began construction this year and is currently scheduled to open in 2020. 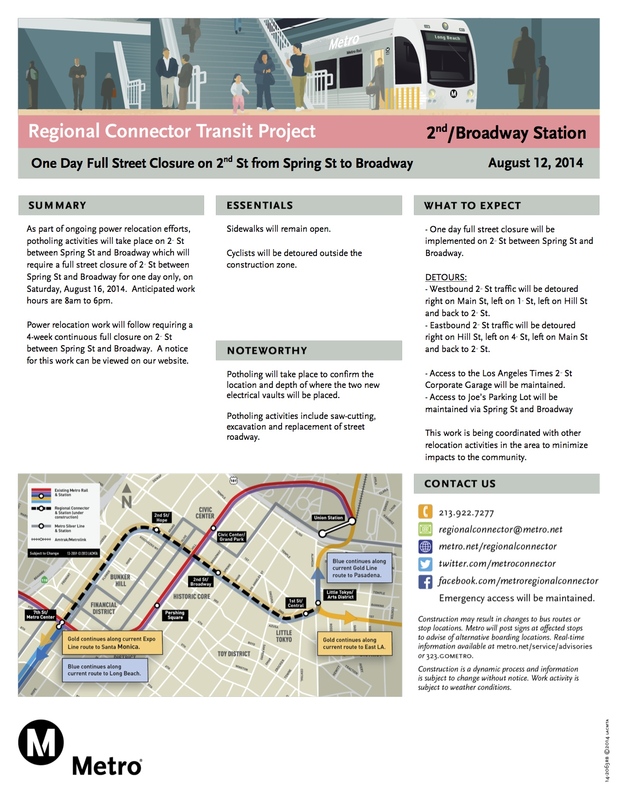 Steve, has Metro scheduled an official groundbreaking ceremony for the Regional Connector yet? If not, is there a rough idea when one might be held? While I’m not Steve, I can answer that question, and the answer is: no groundbreaking scheduled yet. It’s looking like it may happen this fall, we should have a more definitive answer after September.